Quality meats at competitive prices! 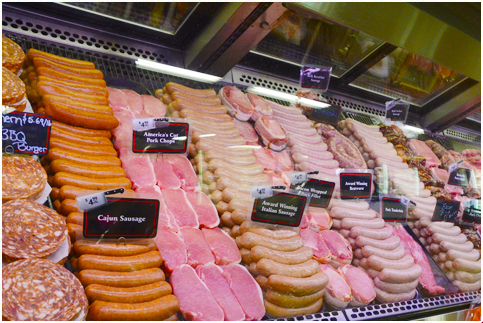 Visit our full service meat department and have our staff assist with any purchase either in person or by phone. Inboden’s Meats offers its customers a unique selection of superior meats at competitive prices. Inboden’s has been filling home freezers with our humanely raised, locally grown beef inspected for wholesomeness and quality graded. Our native bred cattle are of the highest quality. Call for market price on a whole cattle, sides of beef (half), hind quarter or front quarter. Our long history of providing quality meats and superior customer service makes us the top choice for a growing number of individual (private) and commercial (business) customers. Browse our website today and see for yourself. We are sure that when you see what we have to offer, you will want to join our ever-expanding customer base. By following the original standards of quality and customer service set forth in 1962, Inboden’s has grown to be a leading provider of wholesome high quality meats. Inboden’s sells only the finest USDA Prime Grade & Top Choice meats. Procured from only native cattle breeds (including Angus, Hereford, Shorthorn.) Only the top 10% of the graded cattle harvest meets our stringent quality standards. All beef steaks are naturally aged to produce tenderness and rich flavor. We use no chemical tenderizers or flavoring agents. 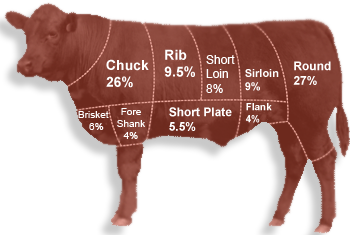 Click Here to see what goes into grading meat quality. DeKalb County has had a long tradition as being one of the top hog producing counties in the state of Illinois. Inboden’s procures locally produced pork out of Berkshire and Duroc breeds. Inboden’s also procures local poultry upon availability.